A lot of us rely on Wi-Fi, whether we’re working from home or out and about. But where do you go if you need Wi-Fi and don’t want to pay extra for it? Trent Hamm at The Simple Dollar lists 19 places to find free Wi-Fi. And you probably have at least one of these places near your home. These free Wi-Fi spots might not take the place of your home modem, but they’ll provide you with a quick Wi-Fi fix when you’re out. Public libraries: Your local public library will nearly always have a free Wi-Fi connection. You may be required to take out a library card to get the password or code. Public parks: Believe it or not, parks are starting to offer free Wi-Fi connections. Here’s a list of free Wi-Fi equipped parks by state. Museums: Check your local museums to see if they offer free Wi-Fi. If the museum has Wi-Fi but also charges for admission, remember you can always duck into the lobby for a quick, free email check. Hotels: Some hotels offer free Wi-Fi in the lobby, no doubt for busy travelers who need to check in with the office right away. Hotels change their Wi-Fi policies often, but use this list to see if there might be a free Wi-Fi spot in a hotel near you. Airports: If you just need to pull up a few websites, it’s much more trouble than it’s worth to go all the way to the airport for a little free Wi-Fi. However, a lot of airports have added complimentary Wi-Fi to their list of amenities. If you’re flying out of town, check this list to see if your airport’s Wi-Fi is free. Hamm notes many businesses offer free Wi-Fi to customers. Best Buy: Another huge chain store where you can duck in and use the free Wi-Fi without buying anything. The next time you’re away from home, don’t pay for Wi-Fi — use one of these spots and connect for free. Want the full list of free Wi-Fi spots? Read Trent Hamm’s story at The Simple Dollar. 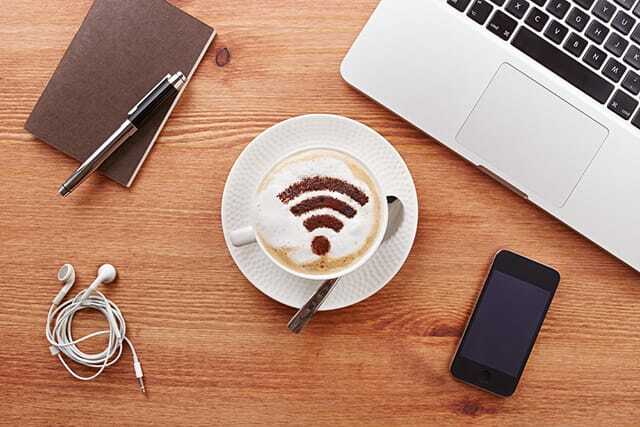 Your Turn: Where do you like to go for free Wi-Fi?